Hi there! My name is Sydney Ross and I am a freshman Horticulture and Crop Science student at Cal Poly San Luis Obispo. Specifically I am an Agricultural and Environmental Plant Sciences Major with a concentration in Greenhouse and Nursery Plant Production. This past year the HCS department decided to change things, as far as majors go, for future students starting with the graduating class of 2015, my incoming class. Previously I would have been admitted as an Environmental Horticultural Science student, but due to the creation of new concentrations, I’ve had the wonderful opportunity to become an AEPS “Ape!” I am extremely, extremely, happy with my choice in major. Although I have only had the pleasure to experience one quarter at Cal Poly so far, I have learned many lovely and fascinating things about plants through HCS already. Before I came to Cal Poly, I frequently asked myself, “What am I doing?” or rather “Is this really going to be right for me?” (Suddenly it seemed as though the world was my oyster. Wow, that is cheesy, but hey, it’s true!) As soon as I started taking all of my introduction to horticulture classes however, I knew abruptly I had made the right choice; not only in school, but also to become a HCS student. Well, I honestly can’t think of anything I would rather be doing than working with plants. But before I dive into my love for nature, a little about myself. I was raised in Huntington Beach, California, which is pretty far south. It is also known as “Surf City USA.” Huntington Beach is an amazing place–so beautiful–I feel truly fortunate to call it home! 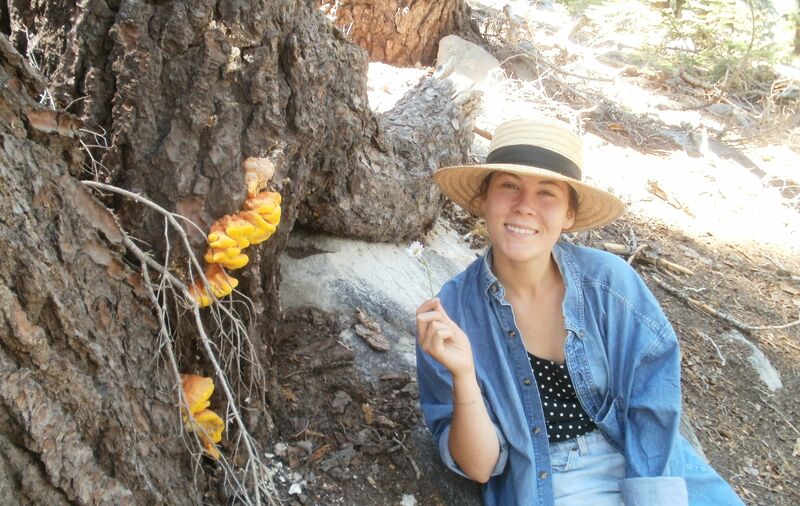 My personal favorite pastimes include hiking; backpacking, going for long walks with my pup, Charly, pressing, picking, and collecting plants; sketching; and of course fungus hunting! (I will admit I am a bit of a dweeb when it comes to mycology.) Frequently you can find me wandering around various parks, nature preserves, and the good ol’ outdoors. I think it was my love of exploring nature that turned me onto the idea that I could cultivate plants for a living. Just the thought of one day owning or running a greenhouse puts a large grin on my face. My favorite plants and fungi include poppies, echeveria, irises, manzanita, rosemary, lavender, banksias, shaggy mane, sulfur shelf, yellow coral, witches butter, fairy ring mushrooms, and amethyst laccaria (I’m going to stop myself here, before this goes on forever.) There are so many beautiful and exotic species in the world to see that learning about them is one of my favorite things in life. Besides being a horticulture student, I am also the Eco-Representative of my dorm. I promote all aspects of sustainability, recycling, etc., as well as am an active member of the Real Foods Collaborative here on campus, working to integrate more fresh and locally grown foods into the campus diet. As you can tell I am a very busy and love it here in San Luis! I look forward to telling you more about my fantastic experiences here as an AEPS student, so until next time upward and onward!